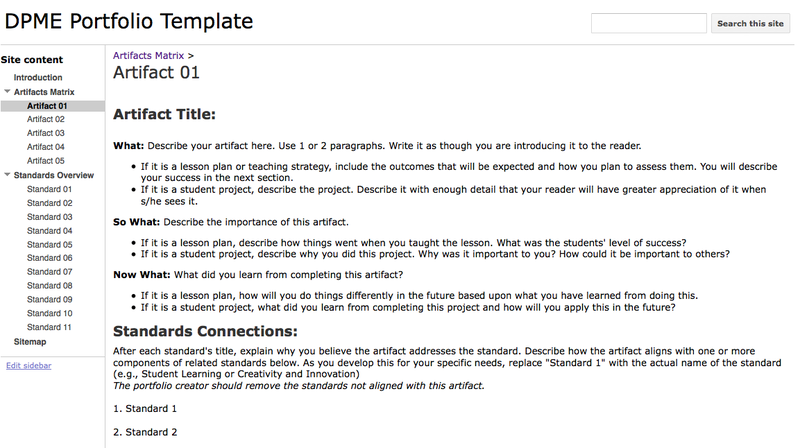 These templates are designed to provide a space for reflections that include a description, analysis and future plans for each artifact. Connections to the specific criteria for each pertinent standard are explained here as well. Finally, the artifact is either attached to the page or a link is provided to access the artifact. These pages contain three basic parts: Reflection, Standards/Criteria Connections, and the attached artifact or a link to its digital representation. Title: Begin by placing the title of the artifact in the title, ex. Artifact 1: Math Lesson Plan. Image: It is useful to include a screenshot image of the artifact. This will provide your reader with some context for the artifact. It is usually placed in the upper right corner. Reflection: Write a reflection about the artifact. The recommended format is What? So What? and Now What? This format can also be thought of as Describe, Analyze and Plan. Reflections are typically three paragraphs in length. The first paragraph is where you describe the artifact. You analyze the artifact in the second paragraph. This analysis might include descriptions of the success of a lesson or the significance of an event. The third paragraph is where you explain what you learned from the experience and how it will impact future practice. Standards/Criteria Connection: Explain how an artifact meets each of the criteria identified on the Artifact Matrix and Individual Standards Pages. Each explanation is prefaced with a number and letter representing the specific criteria/component (i.e., 1g, 3d, or 7c). Artifact: Place an artifact on the page or create a link to the artifact. Insert a photo of the artifact the same way as on the Opening Page. Create a link to a digital artifact on a website or attach the artifact file to your artifact page.